It is a real pleasure to join you here at the University of Sheffield in the golden autumn to unveil the Model Confucius Institute. What better time than this season of harvest to celebrate 10 years of achievements of the Sheffield Confucius Institute! 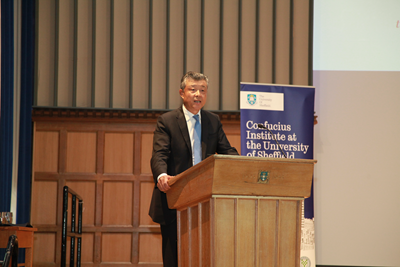 On behalf of the Chinese Embassy, I would like to begin by extending my warmest congratulations to the Sheffield University and the Sheffield Confucius Institute. This is my first visit to the Sheffield University. But you are no stranger to me. I know Sheffield well not only because you are a member of Russell Group and a top British university. I know Sheffield also because your ideals have a great deal in common with the philosophy of Confucius. The first thing in common is the commitment to educating the wider public and the ordinary people. When the Sheffield University was established, the first line on the poster said "the university will be for the people". The story goes that it was precisely because of this line that each and every worker of Sheffield gave a penny for your university. In China, Confucius was the first to advocate education for the common people. He was known for championing the idea of "providing education for all people without discrimination". He believed that people regardless of their social classes, wealth or intelligence, should all have access to education. Your second thing in common is the attention to mutually reinforcing teaching and learning. In the middle of the coat of arms of Sheffield University is an open book inscribed with the Latin words meaning learn and teach. That's what Sheffield emphasizes. That was also what Confucius advocated. He attached great importance to the interaction between teaching and learning. The core of his philosophy about education lies in this: "Never be complacent with your learning, and never be impatient with your teaching." The third thing you have in common is the emphasis on studying the causes of things. The motto of Sheffield University reads, "To discover and understand the causes of things". Confucius encouraged people to enjoy the process of exploration and discovery. He said, "In learning, knowing the way is good and having a passion for learning is better. But better still is taking a delight in learning." These words reveal the three stages of learning. The first stage is having the ability to acquire knowledge. The second is to be passionate about the causes of things. And the third is to take delight in putting knowledge to practice. Sheffield's commonality with Confucius is only part of the story. Sheffield's ties with China have grown closer and closer over the past years. As early as 2006, the University of Sheffield started its cooperation with Beijing Language and Culture University and Nanjing University. The establishment and development of the Sheffield Confucius Institute should be attributed to such cooperation dating back more than a decade ago. Over the years, thanks to the strong leadership of Professor Sir Keith, the Sheffield Confucius Institute has made a number of remarkable achievements. At this year's UK Final of the 16th Chinese Bridge - Chinese Proficiency Competition for Foreign College Students, David Geary from the University of Sheffield won the first place. His performance was convincing and his rap in Chinese dialects was more than impressive. It was not at all surprising that he went on to take the first place at the World Final. At the just concluded Chinese Bridge Competition for Foreigners across the Globe, the Sheffield Confucius Institute was the only UK team that made it to the top 36. These are quite some accomplishments. They are achieved because the Sheffield teachers are "never impatient with your teaching". They are achieved because the Sheffield students are "never complacent with your study". It is your hard work that has led you to the award of Model Confucius Institute. Out of 511 Confucius Institutes in over 140 countries around the world, only 31 are awarded this title. Sheffield is one of them. I must say, this title says a lot about your achievements. Now the question is how to live up to this title? Let me share with you my thoughts along the line of Confucius' three stages of learning. First, to know the way to advance Chinese language teaching and learning. There is a great deal the Sheffield Confucius Institute could do. I myself have long been an advocate for Chinese language learning in the UK. Chinese language is spoken as a mother tongue by the world's largest number of population. It is a carrier of the Chinese culture. Its beauty and influence has made itself a Chinese heritage. I am most delighted that, at many British schools, Chinese has become the first choice of foreign language. I am also excited that Chinese language teaching is one of the most vibrant fields of cultural exchanges between China and Britain. Over the seven years and more since I came to Britain as Chinese Ambassador, the number of Confucius Institutes in Britain increased from 13 to 29 and Confucius Classrooms from 57 to 145. As China and Britain continue to build the "Golden Era", the enthusiasm for learning the Chinese language is expected to grow further. From business leaders to young talents and even small children, more and more people want to learn Chinese. The demand is huge. It is incumbent upon the Sheffield Confucius Institute as a Model Confucius Institute to keep improving the quality of its teaching and learning. Second, be passionate about telling the story of a real China. The Chinese language carries five thousand years of Chinese civilization. It is a bridge of mutual learning between China and the West. Therefore, being able to speak Chinese is like holding the key to discover the gems of the Chinese civilization. It is like building a bond between the Chinese and Western cultures. But learning to speak the language is only the first step. To understand the Chinese civilization, one needs to be passionate about the stories in it. There are three elements at the heart of the Chinese culture. The first element is harmony: harmony between people, harmony between individuals and the society, and harmony between man and nature. The second element is holistic thinking. In dealing with specific problems, the Chinese people always give priority to the larger picture and always take a long-term perspective. The third element is the aspiration for peace. For many years in its history, China had been strong and leading the world in many areas. But we had never invaded others because of our strength. A most convincing example is Zheng He of the Ming Dynasty. More than half a century before Columbus discovered the Americas, Zheng He's fleet had already reached the coast of India and East Africa. But he was there for trade and friendship, not land or resources. Today's China follows the same philosophy. Our goal of "Chinese dream" and the "two centenary goals" originate from the holistic thinking in the Chinese philosophy. These goals focus on the larger picture. They are long-term strategies. In diplomacy, we stand for resolving international disputes through dialogue and negotiation. We firmly oppose to the use of force. This is also due to the peaceful nature of the Chinese civilization. China's fast development is full of exciting stories. Regrettably, here in Britain some people's knowledge about those stories remains superficial or sometime even biased. Recently, a British friend shared with me his first experience in China. He was there for a business conference. He said the "live version" of China is a sharp contrast to the "British media version". The "British media version" depicts China as a closed, rigid country that only produces cheap products. But what he saw in China with his own eyes was the exact opposite. China is a fast developing, vigorous nation with open and inclusive culture. In his meetings, either private or public, he has found the Chinese people to be always optimistic, passionate and confident when talking about China's system and governance capabilities. He learned from a fellow Chinese participant at the conference that the Chinese selection of officials is based on performance and competence. They may not be eloquent orators, but they care about delivery. Any official in China who cannot deliver tangible benefits to the people will have to go. In his summary of his first ever trip to China, my friend attributed China's huge success to the far-sighted leaders, competent officials and the industrious, hard-working people. The change of perception about China, which this British friend went through, is not an isolated case. Many more people share his experience. If one tries to understand China through the western media alone, he or she could easily lose sight of the whole picture. I think this is a gap that the Model Confucius Institute can help to mend. You have the language advantage and local connections. You can share with the British people the story about a real China. You can help them see the bigger, colorful and vivid picture of China. In a time of drastic changes, there are always great stories to tell. The story of a real China needs a better narrative. The Confucius Institutes have on your shoulders the responsibility to tell a good story about today's China. Now let me turn to my third thought: to take delight in engaging more people in the process of advancing China-UK relations. 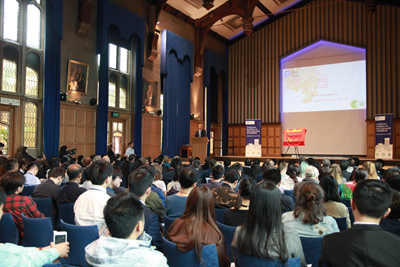 The Sheffield Confucius Institute is a success story of cooperation between three universities from our two countries. One decade on, it has blazed a distinctive path of development. For years, Sheffield University has been innovating and enriching the way Confucius Institutes teach the Chinese language and Chinese culture. In that process, you have built strong ties with the local community. And you have contributed to closer cultural and people-to-people exchanges between China and Britain. Your extensive cooperation with Chinese universities is a good example. Over the years, Sheffield has continued to expand your cooperation with China's Peking University, Qinghua University, Renmin University, Zhejiang University and Nanjing University to new areas. You are also cooperating with Shanghai Space Agency and Shanghai Jiaotong University in the field of aerospace-related manufacturing, including China's space station programme. 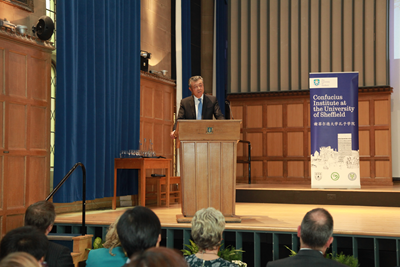 Sheffield is also working creatively to integrate the resources of the Confucius Institute with that of the University. This ranges from training of innovative talents to joint R&D projects. These efforts are diverse, practical and delivering win-win results. 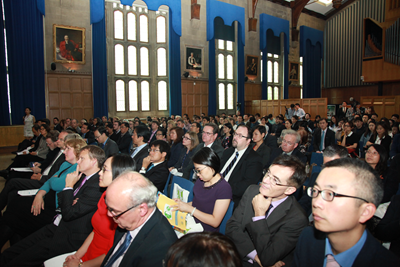 This year marks the 45th anniversary of the China-UK Ambassadorial diplomatic relations. It is also a year for consolidating the China-UK "Golden Era". I have learnt from my four decade long diplomatic career that good state-to-state relations hinge upon close people-to-people exchanges and heart-to-heart communication. To establish heart-to-heart communication, we need to engage each other, get to know each other and understand each other. This is the significance of the Confucius Institute. President Xi Jinping said during his state visit to Britain in 2015, "Confucius Institute belongs to China, and also belongs to the world." Confucius Institute is an important platform where people can learn about China. It also offers an important channel of mutual learning and cooperation between China and other countries around the world. I sincerely hope that, with the help of the Confucius Institute, the young people of our two countries will take delight in facilitating closer heart-to-heart communication between China and Britain, and between China and the world. I hope that with your vigor and talent, you will be able to contribute your part to China-UK "Golden Era", to a community of shared future for mankind, and to a more splendid and harmonious world for all.